Sometimes we need very little to look trendy. Instead of bundling in luxurious fur and donning intricately detailed dresses, modern fashionisers crave minimalism and simplicity, giving preference to outfits that celebrate a distinctive polished style, interesting cuts and zero extravaganza. The latest Rachel Zoe fall/winter 2015-2016 collection is for these women, coming as a fresh source of inspiration for dressing in a neat contemporary style with notes of Sixties. Moving away from her brand’s iconic bohemian roots, Rachel Zoe mixed Mod Brit motifs with Sixties silhouettes injecting a modern touch into each and every of the 20 looks unveiled. And since it’s her favorite season, she offers an array of cool and cozy outerwear designs and a nice game of layering. 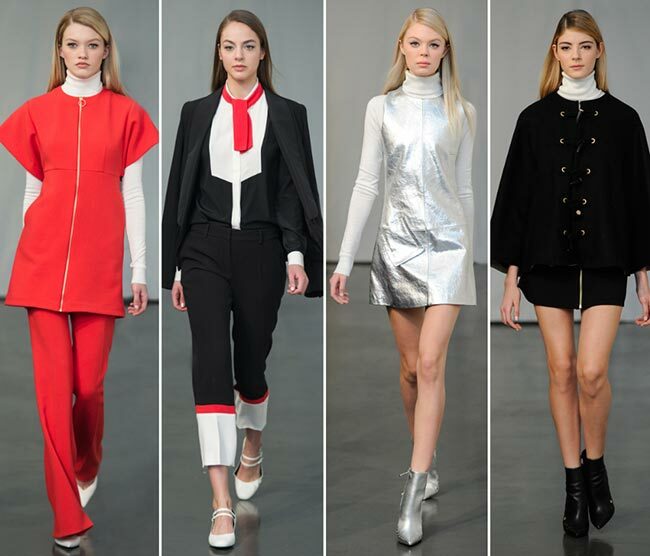 Although the opening look of the Rachel Zoe fall/winter 2015-2016 collection came in bold red tones mixed with some whites, the entire collection focuses on timeless black and white colors only, at times also presenting metallic and glittery motifs used for the evening looks. The pieces are perfectly tailored and predominantly monochrome with just one or two looks featuring a head-to-toe busy print. Fluffy fur inserts, feathers, metallic buttons, deep V-necks, oversized buckles, zips and lacing are some of the noteworthy details spotted at the show, which come harmoniously combined with distinctive ’60s cuts, shapes and elements. While the mini dresses in black and white tones and the white jumpsuit with black trimmings adorned with a black fur scarf added to the shoulder radiate a big dose of femininity and sophistication, we can also spot subtle masculine inspirations having a big influence on certain looks, such as the printed tuxedo jacket matched with a pair of tailored pants and a printed shirt. The pair of classic pumps secured the right dose of femininity for this look. Tuxedo dressing is spotted more throughout the collection and we especially love the black pantsuit worn with an oversized black coat that is a perfect option for modern business ladies. 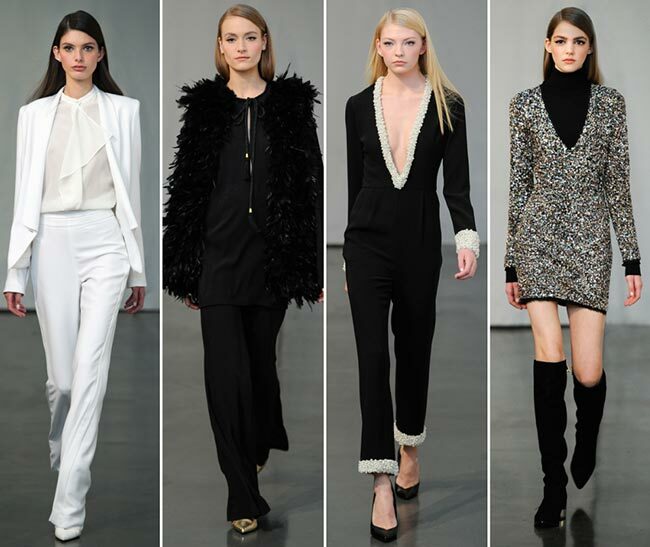 The finale of the show is marked with an array of evening-ready looks, of which we especially love the black velvet jumpsuit with a deep V-neck encrusted with white pearls. It’s a luxurious look that skillfully combines minimalism with opulence. Other than that, we have a bejeweled mini dress worn with a black turtleneck, a sparkling gown with a front slit matched with a luxe fur coat, a little metallic silver dress and a simplistic white gown with small pearl detailing. The accessories and beauty choices had been picked with great attention to match the overall mood and style of the collection. Thus, as expected we saw Twiggy lashes and natural hair inspired from the famous ’60s style icons. High-shine metallic heels are great additions both to daytime and evening looks.